Large capacity offers enough pill space for long trips or day-to-day use. Features tight plastic that hinges snap open easily and snap closed securely to prevent spilling. 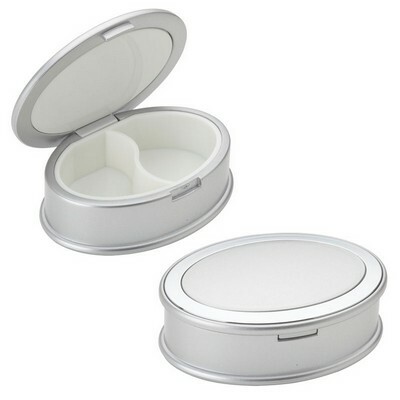 This Salute II Oval Pill Box are made from plastic and feature a hinged, snap-tight lid. Due to its oval shape, this pill box is able to hold a variety pills and vitamins, large or small. This Pill Box will separate your daily dose into two small compartments. Add your company name and logo to create a marketing tool that everyone will want to get their hands on.